Helping pastors and church leaders with the business of church. The long and forgotten block party. I know that some neighborhoods are still extremely friendly and do block parties, but this is no longer the norm in our society. I watch my neighbors pull into their garages and close the garage before they get out. My neighborhood can’t be the only one where this occurs, is it? One of the areas I am passionate about (besides systems and efficiency and structure and…) is community outreach. Local outreach doesn’t have to be complicated or expensive. It does need to be intentional. I was on staff at a large local church that had a longstanding history of doing global missions extremely well. They took Acts 1:8 to heart, at least the part of being God’s witnesses to the end of the earth. They weren’t great at reaching their Jerusalem, Judea, or Samaria. 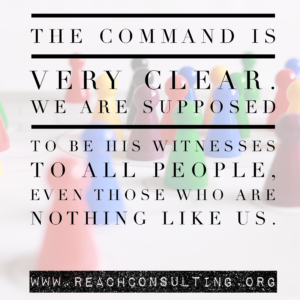 I don’t know about you, but it seems pretty clear we are supposed to be His witnesses to all people, even those who are nothing like us. I had the privilege of starting several new ministries that focused on our local community. One of my favorite events was a back to school outreach. We bought backpacks, had the congregation bring items to put in them, we had a backpack stuffing party, and then we had a community party with a bbq, bounce houses, and those in our low income community could buy a stuffed backpack for $2. Like all of us, when we pay for something we are bound to take better care of it than if it was free. We never forced anyone to give us their information, but always gave them an opportunity to connect with us in various ways. This outreach reached a felt need. We always ran out of backpacks, increasing the number we had available each year. I haven’t seen many of these local outreach events in more prominent areas of town. A local church is doing community block parties at parks located in the different communities. My family couldn’t pass up a free event, so we made our way over to our local park. It was simple, fun, and although we already have a church home, it was a great way for them to connect with the neighborhood, letting people know they exist as a church and care. All of the volunteers wore the same colored shirts. It was easy to see who was from the church. Bonus points for the fact that the shirts were cute. It was a modest event, but put on well. They had a bbq for free hot dogs, drinks, snow cones, cotton candy, and face painting. The different pop up tents housed each of these items. Bonus points for the fact that those doing the face painting were amazing. They had games to play. Ladder ball, corn hole, and a bean bag toss. It didn’t have a fancy bounce house (which I would have loved to wear my kids out in) but it had fun interactive games. They didn’t do an event for an events sake. They did a raffle where they were able to collect names to invite people to come to their church. If you didn’t want to give your information, that was fine, no one was there pushing to get your information. It was a casual way to start a relationship. They have only done a handful of these events, and people are going to their church and coming to know Jesus. A couple of hours of their time, a handful of volunteers, and the lives of individuals is impacted for eternity. Seems like a no-brainer to me. It may not be a good fit for your church to do local outreach block parties, but what would be a good fit for your church and community? The bigger question is, how are you reaching your immediate community for Jesus? What if the Pastor Dies? Get 6 Free Sections of CHURCH BUSINESS! this book can help with the church business. You're almost there! Fill in your email address below and get instant access to CHURCH BUSINESS!